Pop-ups are popping up everywhere! Pop-ups are temporary, or short-term, insertions into interior or exterior spaces. They can involve single events or multiple events. Pop-ups intend to transform the perception of spaces and to add new excitement and new engaging activities for people. Pop-ups may be seasonal (like an ice skating rink or raised bed gardens) or may be a one-time event like an outdoor play. Pop-ups animate and activate low energy areas in new and surprising ways. They attract people to come to a place and spend time. Pop-ups can be as temporary as chalk hopscotch running across communities on sidewalks. Pop-up happenings might be giant inflatables that react to music. They can be more developed as a corner popcorn or ice cream wagon. They can small like individual mime acts in a park or larger like musical concerts or plays in the park. 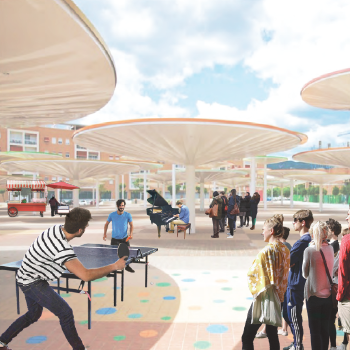 Pop-ups imagine different uses in shared public spaces that are underused. Pop-ups bring new activities and newcomers to enjoy activities together. Most of all, pop-ups are surprising and loads of fun! Let’s get popping! Activity 1 – What's popping? Take a look around your home, your school, your community. What’s popping? What is new and temporary? What’s the buzz? What fun activities are already in place? What activities increase anticipation? What activities are exciting? What sounds and sights will draw people? How could those activities create an event space in your school or community? What do you need to do to attract attention to draw people to come and enjoy an unexpected activity in and unexpected place? Pop-ups ask you to “pop open” your imagination hats! What questions do you need to ask? What emotions are you interested in awakening? What do people need to be involved? Is politics needed to activate a pop-up? What do you want to have? So many questions! So little time! Make a list of pop-ups already in your city. Activity 2 – What needs to pop? Ok. So now your mind is actively popping. Questions come up. Ideas arise. You think of people. You think of places. You imagine what a pop- up in your school could be. You imagine what a pop-up in your community could be. Your mind is whirring with possibilities. Looks like it is time to “pop-up” some people. While your ideas are surely terrific, pop-ups are successful because of people adopting them. You are you. People are people. What people might you include in YOUR thinking? You can imagine (and write about and diagram) possible users, but really. Wouldn’t it be better actually to talk to real people? Who would those people be? How will you contact them? How will you interview them? How will you chart their ideas? How will you assimilate their ideas with yours? Looks like it’s time to reach out. Reaching out in a certain way is a type of pop up because it surprises others ( and maybe even yourself) in making connections. New Connections. Now is the time to talk to others. Interview them. Question them. Engage them. Connect with them. Make a list of questions ask in your Pop-up interviews! Find out what needs to POP! Activity 3 – Where is popping needed? Using a map of your city, locate existing pop-ups. Now take a closer look and imagine places that could use something temporary and fun. Look at open parking lots in your city; are some empty during the week? Are some empty during the weekends? These make great pop-up spaces. Look at open green spaces in your city next. Consider ones that could use a bit more action. Next, look at the wide streets with parallel parking. Pick some parking spaces to have seasonal pop-ups. Make a pop-up map! Save this map for the next activities as a locator key. What prompts activate a successful pop-up? A prompt is some trigger that motivates, raises curiosity, opens anticipation and initiates movement. Think about what you have learned from people. Did they like to hear music? Would they visit places with games to play? Did they want to see performances? Were they special lights? Some pop-ups involve objects. Some involve systems. Some involve architecture. All involve people! Paris river vendors are pop-ups that open in good weather to sell antique posters, prints, books and cards. Pop-ups offer short or long-term structures for storage, service, presentation. Make a list of pop-up prompts. Now that you have taken a look around, interviewed people and imagined pop-pop ups, now is the time to make a seasonal chart of possible pop-ups. Winter spring, summer, and fall bring different temperatures, smells, sights and sounds. Create a calendar with pictures or drawings of pop-up activities when it is warm, hot, cool and cold. Farmers Markets and Flea Markets are popups that set up booths daily, weekly, monthly or seasonally. Exercise parks pop up in parks as unloaded kits of equipment and mats and signage to draw people outside to exercise and learn about healthy movement in good weather. Summer, Fall, Winter, Spring. Pop IT! Activity 6 – Pop IT! Pick your favorite pop up and try your hand at modeling it. Make at least two small-scale conceptual models of a pop up in your city. Have a least five components to it. 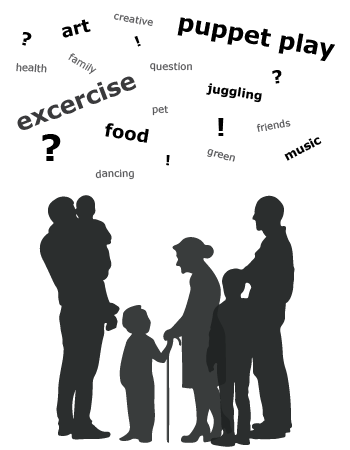 A component will prompt or support an activity like walking, sitting, watching, listening, eating, playing, etc. Create a name for your pop-up and consider what materials you would need to build it.